Look, a Horse! Well, almost. I’m just gonna say it: I think horses are harder to draw than people. Can I get an amen from anyone out there? I attempted to draw this photo from Kathy at Backyard Bird Nerd. (There are a whole bunch of images there, this one is fourth from the bottom. I’m sorry, Kathy, I know you didn’t take photos of a moose!) Horses were easier to draw in middle school when I sat in the library with my friend Laura drawing them from (mostly her) imagination! No clue why, but that’s what’s happening now. This first sketch ^^ was drawn late at night, and although it wasn’t horrible, the head was much too short, and I wasn’t happy with the way the burnt siena Polychromos was laying down in my art journal. (It was a bit scratchy, I’ve noticed a few colors can be like that at times.) But I thought “No big deal. I’ll draw it tomorrow when I’m fresh, with a different color, and it’ll look way better.” Except not. I first tried a Sakura design colored pencil because it was closest, and managed only a very slightly better attempt with a nougat Polychromos (on the bottom)….and they both look more like moose(s) than horses! I checked with Hub, and yes (he doesn’t sugarcoat anything), he agreed if I added antlers, they’d look more like moose. The moose is on the loose, and roaming all over my sketchpad. I guess it scared off the horses. The good news is that this book is on hold for me at my local library. I hope to do further study, maybe draw some of the sketch examples in the book to help me along, and make another attempt. I can be pretty stubborn when I wanna be. So we’ll see how this thing shakes out. I think you nailed it in the top one Laura. I’ve never tried to draw a horse – and now I’m a little scared! LOL! Happy Tuesday cutie! Be afraid, be very afraid lol. The moose is on the loose!! Have a great day, my sweet! I only drew a horse once…I like yours! I think you are being too hard on yourself…your horse sketches are wonderful! I think animals are generally easier than people….but horses have a lot going on…. Oh, thank you, Rebecca. I appreciate it. Maybe I should table horses for awhile, but I have a friend who loves them very much; thus, I’ve not given up the ghost yet. Thanks very much for your encouragement. They definitely have a lot going on!! Good morning Laura – you’ve made a good start. I think your sketches are very good. And, by the way I didn’t see a moose 😎. As long as you are having fun on your courageous art journey, that’s all that matters. I think you are being way too hard on yourself! And if I keep reading your blog, I just know I am going to sketch something over the summer. If I do, I’ll let you know, but I’m certain not to show! Thank you, Kathy!! If you want to feel inspired about beginning your own art journey, look up Jodi’s blog at Life in Between. Her comment is toward the top. She just started painting and you won’t even believe the portrait she just did of her dog. Anyone can do this. Jodi and I are proof of it! I hope you do show, but even if you don’t, please sketch if you’re feeling called! I ignored that call for over 20 years. Well…I did it…sketched a Nuthatch for fun. 🙂 Would offer you proof, but am not posting a picture on my blog! Kathy, you could email me at createarteveryday@comcast.net, if you felt like it! I’d love to see! Are you glad you did it? Did you enjoy it? That seems pretty good to me. I’ve not tried a horse yet. I am still baffled by trying to draw people. I understand. I always was too. I don’t know what happened. A switch got flipped somewhere during Open Studio. Maybe I inhaled the talent of the other artists exhaling in the room? I still don’t get it. But that’s the day it all changed re people. I may get pretty discouraged if I keep drawing horses! I may have to take my foot off the gas. Oh and PS: Changing to colored pencil made all the difference for me in drawing. Stonehenge paper and colored pencil. I’m telling you, it was key. I tried a portrait the other day on regular paper and pencil and it looked like a first grader did it. Interesting. I found myself coming back to colored pencil recently. I’m really thinking paper makes a difference too. I’ll look for Stonehenge next time I’m at Blick. I hope it’s magical for you too. Haha, don’t mean to send you back to DickCrack. 🙂 But yeah for that paper, it may be worth it. I’ve not tried any other medium in that paper, but I’m sure almost anything would work. Even light WC, most likely. Seriously, you do a lot better than you give yourself credit for sometimes. 🙂 I don’t think horses are necessarily harder than humans to draw. A horse just has to resemble a horse whereas humans have to look like specific people. Teresa, thank you. I always soak up your encouragement like a sponge. I just want my horses to be less like moose. lol. At this point, they’re harder for me. So many curves, shadows and lines. For me, way more than the human face, and all so close together. Even the veins pop out. Egads. 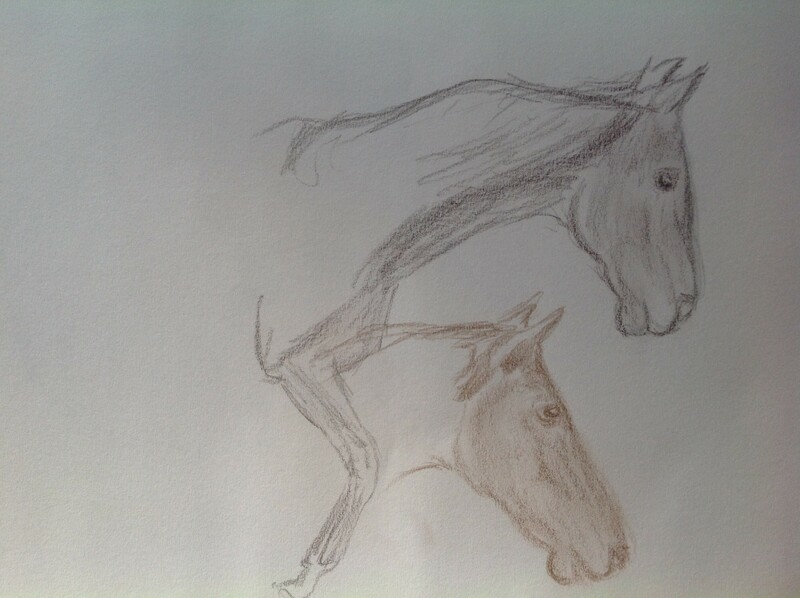 I think your horses are coming along very nicely :-). And they most definitely look like horses – the jaw, the slope of the muzzle… It is interesting that you mentioned the similarity between moose and horses. I never really thought of it before. I found this moose image which makes the similarities quite striking. Books are awesome. I went to the art store yesterday and felt the desire to get a book on how to draw. There are just so many materials to choose from! They really are similar! Thanks for that photo. I hope you found a book that you really love, or multiple books, even better!! Can’t wait to see your creations!! It does help, thank you Jill! I wish I could bop that critic over the head sometimes lol. I feel exactly the same as you and I get very ticked with myself if the drawing isn’t really close to the photo, or at least, what I see in my head. Most often with watercolor I find that there is quite a difference between the two. A friend of mine is really good at painting watercolors and she sells them rather cheaply and donates the money to a women’s shelter. She says she never gets very attached to her painting. I on the other hand get very attached to mine when they turn out surprisingly well. I want to throw a party! I don’t know why I’m telling you this but thought it might help. 1. Totally agree with you on drawing people vs. horses. 2. Both of your sketches are pretty nice! The first one has such soft lines. Lovely pencil work! Thanks! The colored pencils make it sooo easy. I really think they make all the difference (for me, anyway). I just really have trouble with proportions on horses, for some reason. Thanks, Rebecca! I appreciate your encouragement! Can you get this book from your library? I will check and see, thank you art3g! I like your horses! If you ask me, moose and horses have rather similar head shapes, so I think it’s more the color than anything else that creates the perceived resemblance. Maybe a little bit due to the noses in the second one. Not that I’m an expert. I agree with you–horses are hard. Even in my simplified cartoony style, I struggle with their legs. Thank you! They’re definitely a challenge. Amen! 😊 Horses are really hard! Maybe some of the hardest animals… Well, I´ve never tried a cow yet… I think you did a pretty good job anyway!!!! Somehow I missed this yesterday…I think the wordpress feed sometimes plays tricks on us! I just want to add to the chorus of people telling you this looks good. 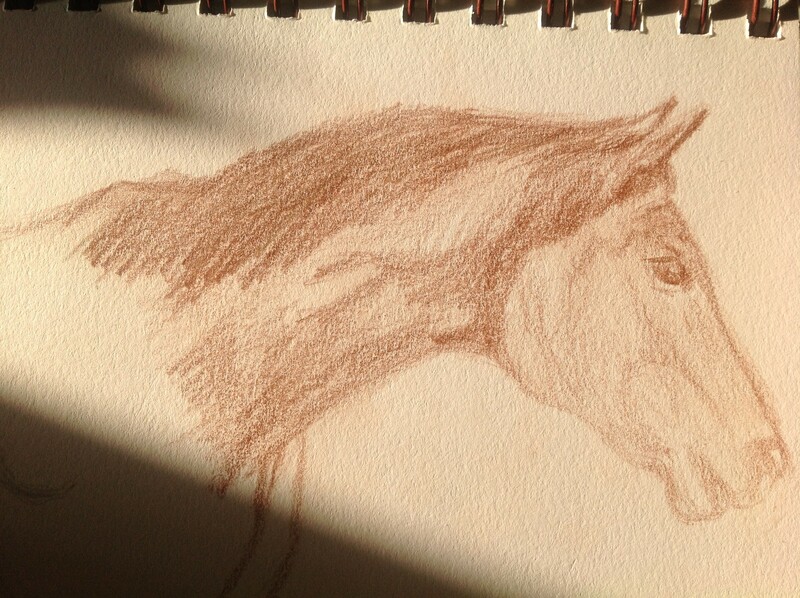 I too drew horses endlessly as a child, but I’m not sure my mother saved any of them (if I ever get into that storage room…maybe this summer), but haven’t tried any since. I do remember also having a book that broke the horse down into shapes, and doing some that way to try to get the right proportions. Good luck! Thank you!! The proportion is so tough with them, moreso than other animals I’ve tried so far. I still need to grab that book from the library. Oh and I have that issue all the time re the WP feed…..